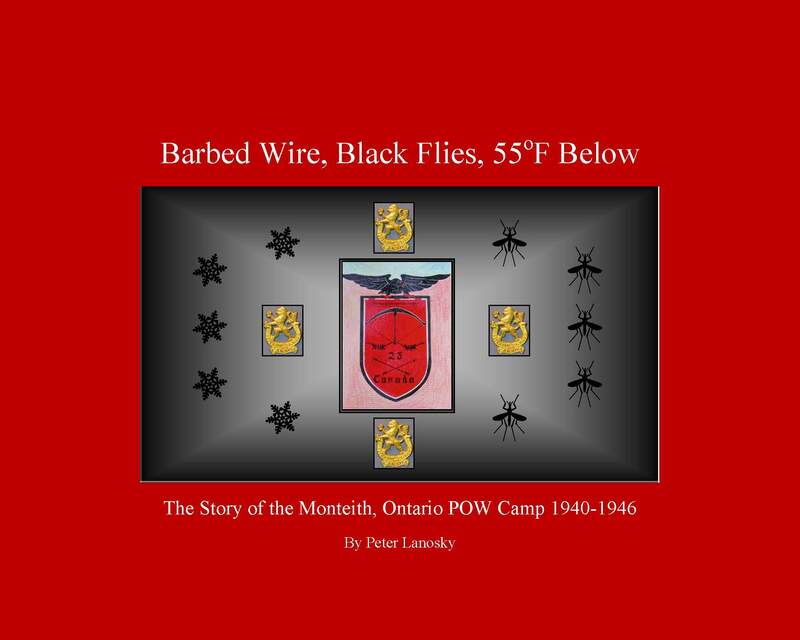 Locally born author Peter Lanosky, in his 2011 publication, Barbed Wire, Black Flies, 55oF Below, chronicles the early history of Monteith and details the events, dramas, controversies, humour and conflicts at Internment Camp No. 23 for German prisoners of war. The camp, open from 1940 to 1946 had a major impact on the residents of tiny Monteith and put the community on the map of key military installations in wartime Canada. Camp 23 grew to become the largest POW camp in eastern Canada with a capacity of 4000 POW and 800 guards and staff. The village of Monteith is located about 11 km south of Iroquois Falls and is the current location of the Monteith Correctional Complex. You may pick up a copy from the Iroquois Falls Public Library. Anson's Folly: The Story of Iroquois Falls was written by Wayne F. LeBelle. 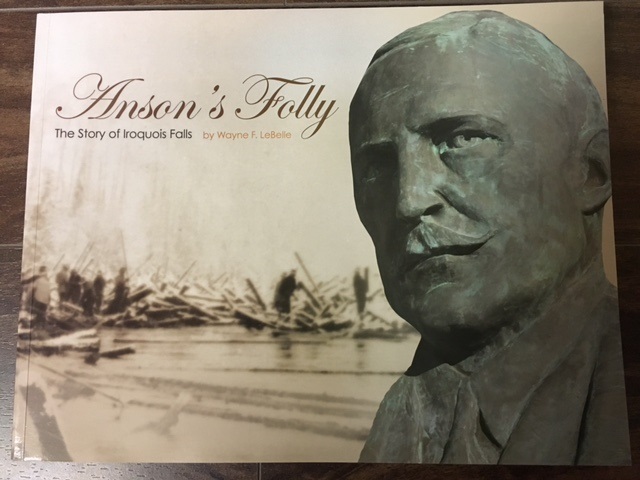 The book is about the Town's founder, Frank Harris Anson and goes through over 100 years of rich history. LeBelle speaks about the Abitibi Power & Paper Company, the history of the people and the struggles that were faced during those times. You may purchase your copy today at The Iroquois Falls Pioneer Museum or the Tuck Shop at the Anson General Hospital for $30.00 + GST. The book is also available at the Iroquois Falls Public Library. 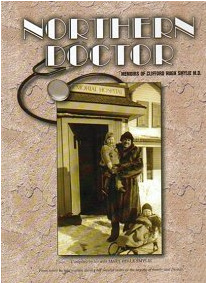 Northern Doctor: Memoirs of Clifford Hugh Smylie M.D. Becoming a doctor in Northern Ontario was, in the early part of the Twentieth Century, quite a different challenge for a young man than it is now, as a new century begins. Clifford Smylie put himself through medical school by working at several jobs, but most notably in the Casey-Cobalt Mine where after some experience in other aspects of mining he became a "cookee" and later, cook. He portrays the life of a doctor in a rural practice, making house and hospital calls in all sorts of weather in the Districts of Temiskaming and Cochrane. Located in Matheson for many years, and covering distances too small for bush planes yet much too great for walking, Dr. Smylie used every means available to reach his patients. Hopping freight trains; driving horses; traveling at high speeds overland in a home-made "snow plane" (no modern snowmobiles yet); and bouncing over ruts in the early models of motor cars, he risked life and limb in the attempt to bring comfort and medical assistance to the people of the northern communities and out-lying farms and camps. This book is available at the Iroquois Falls Public library. 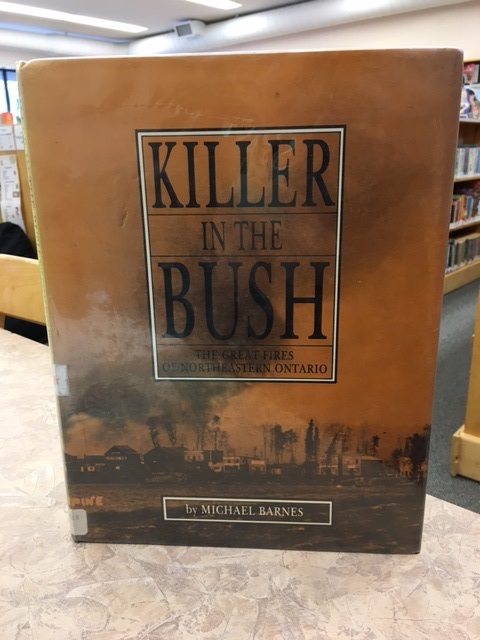 Killer in the Bush: The Great Fires of Northeastern Ontario was written by Michael Barnes. Northeastern Ontario was the new eldorado in the first two decades of the twentieth century. The exciting discovery of silver at Cobalt, followed by gold, first in the Porcupine and then at Kirkland Lake, brought a flood of newcomers to the still largely unknown and lonely land. Many came to find their fortunes in the ground and others came for a new home, carving farmland out from the bush in the rich clay belt soil. The new farmers had little in the way of resources and fire was the only way they had of clearing large tracts of bush. This is the story of the great bush fires of the Porcupine, Matheson and Temiskaming which laid waste hundreds of square miles of virgin forest, caused millions of dollars worth of damage, killed a large number of people, and scarred the lives of countless others and the land on which they lived. Residents of the great districts of Cochrane and Temiskaming did not suffer in vain. The result of the great fires was the improved legislation brought about effective fire prevention and led to the development of the Provincial Air Service and the expertise of the Ontario Ministry of Natural Resources not only in fighting fires but in preserving the woods for future generations. This book is available for $23.71 from Amazon, or you may pick up a copy from the Iroquois Falls Public library. 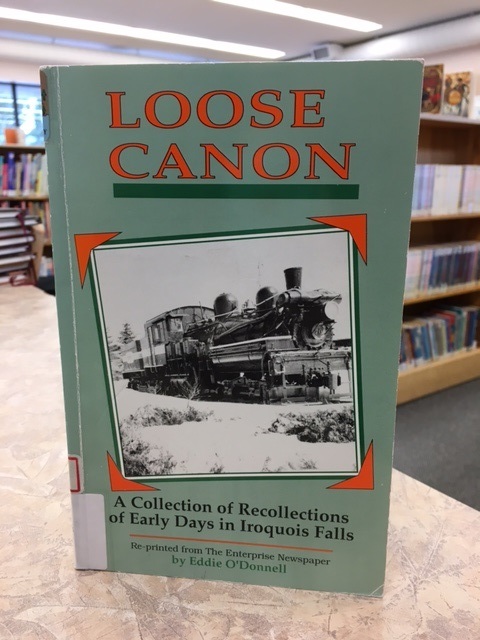 Loose Canon was written by Eddie O'Donnell, born in Montrock (Iroquois Falls) in 1928. Eddie put together a "collection of recollections of (his) early days in Iroquois Falls." "You never miss the water 'til the well runs dry." It's an old saw. And it's true. It applies to my feelings about Iroquois Falls, the town where I was born and began my adventures. I know I'll never return there to live: but I also know I'll always think of 'the Falls' with warmth, and call it my home-town. And when I say, 'the Falls', I mean: Iroquois Falls, Ansonville and Montrock. I lived in all three, and was born in a tumble-down, unpainted shack in Montrock. One day a number of years ago, I was talking with one of my life-long friends, Peggy Koughan, (now the wife of my former Spitfire fighter-pilot, Bill MacLean, and living in Vancouver), and she told me that although she had been subscribing to the village rag, 'The Enterprise', since its inception, she was beginning to wonder about cancelling; she'd been away so long that she rarely read of anything or anybody that meant anything to her anymore.....--except now and then in the 'orbits'....--which was a bit depressing. That got me thinking. And then it got me talking. To Mike McGrath, then editor of the Enterprise. We both agreed that it would be good if the Enterprise were to carry in its pages some sort of column that harkened back to our misty past. We both agreed that somebody should get busy and write that column. We both agreed that I was much too busy doing all sorts of other things to consider such an undertaking. And that's how the 'Loose Canon' broke loose. Home Fires was written by Susan Johnson Cameron. Through the historical fiction Home Fires, Cameron weaves a story of innocence, survival, and courage. 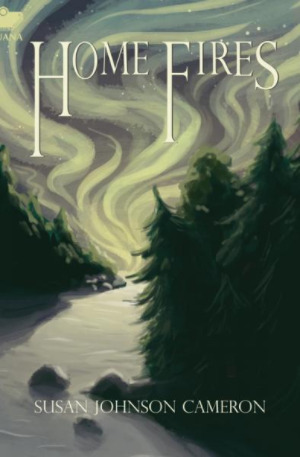 Inspired by the real-life experiences of settlers in a remote area of northern Canada just before and during World War I, the novel follows the incredible journey of Annie Kidd. Annie is a young English woman who follows her husband, Jim, to a new land and fulfills her dream of owning a home and property. Although she and Jim weathered many hardships together, her greatest test is being left on her own with their young children when Jim leaves to fight in the war. The uncomfortably hot and dry summer of 1916 led to small bush fires and heavy smoke. A sudden fierce windstorm whipped the fires into an inferno, leaving Annie and her children surrounded by what would become one of Canada’s worst forest fires.